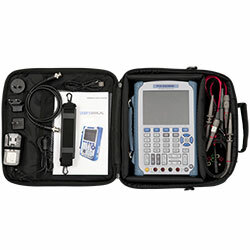 The Oscilloscope PCE-DSO8060 is 3 in 1 oscilloscope. Besides the oscilloscope function, the oscilloscope is also equipped with a multimeter and a function generator. 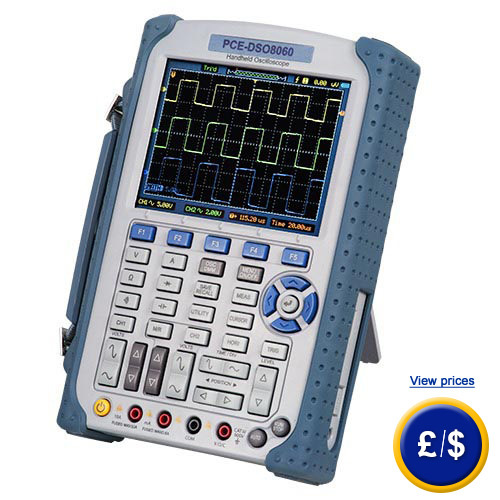 The Oscilloscope PCE-DSO8060 is developed for practical and mobile use. The large LCD display, lighted with LED, can be read very well from every angle. The measuring instrument can be taken anywhere due to the transport loop affixed to the oscilloscope. The affixed rubber shield prevents the oscilloscope from damage during operation or transportation. The handheld oscilloscope is in no way inferior to big desktop devices. It has at its disposal a frequency range from up to 60 MHz and a sampling rate from up to 250 MSamples per second. Besides the easy measurement of all parameters of the feeded signals, the oscilloscope can also carry out FFT analysis. All settings of V/Div, S/Div or the triggering will be performed via the rubberised buttons of the oscilloscope. The two input channels of the PCE-DSO8060 Oscilloscope will be connected via the BNC connector with the probe heads. The probe heads included in delivery can be switched over in the duty cycle between 1:1 and 10:1. A simple key press is sufficient to transform the oscilloscope into a digital meter with different measurement functions such as voltage measurement or capacity measurement. The connection of the measurement cables takes place via the 4 mm banana sockets installed at the front of the oscilloscope. If you have any questions about the Oscilloscope PCE-DSO8060, see the following technical specification or contact us: UK customers +44(0) 23 809 870 30 / US customers +1-410-387-7703. Our technicians and engineers will gladly advise you on all oscilloscopes and all products in the field of regulation and control, measuring instruments and scales and balances. Here you can see the mathematical functions if the Oscilloscope PCE-DSO8060. 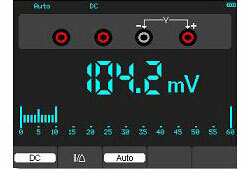 Besides the measurement graph the oscilloscope is able to show all parameters numerically. Besides the oscilloscope function, the Oscilloscope PCE-DSO8060 offers the opportunity to use the device as multimeter. Thus, the oscilloscope is able to measure voltage, electricity, resistance and many more. The presentation will be processed via LC display. Besides the numerical value, a bar graph for orientation of measured value within the measurement area will be shown on the display. The user also receives information about which test socket should be connected to the slotted line. The installed function generator in the Oscilloscope PCE-DSO8060 enables 1 channel output and simulation of several signal forms. The oscilloscope is able to output sinusoidal voltage, sine signal, square-wave signal and pulsed or clocked signals. Thereby the user is freely able to choose the frequency and the amplitude. Besides the easy output of the signals, several modulations as well as signal modifications can be carried out on the oscilloscope. The Oscilloscope PCE-DSO8060 was developed for quick and easy use. Laboratory and workshop are the areas of application of this oscilloscope. Due to such extensive features as multimeter, function generator and oscilloscope, the Oscilloscope PCE-DSO8060 can be used in a variety of applications. The easy handling and the big display allow fast work without exhausted reading through the operating instructions. Next to the actual oscilloscope with its multimeter function and the integrated function generator contains all the test leads. The oscilloscope will be delivered with a plug-in power supply, a comfortable carrier bag and an extensive user manual. The carrier bag makes the transportation of this 3 in 1 oscilloscope very safe. Tradesmen or technicians do not have to take three separated devices (oscilloscope, multimeter and function generator) due to the threefold feature that is integrated in the Oscilloscope PCE-DSO8060. This saves valuable space and enormous costs. The integrated function generator of the PCE-DSO8060 Oscilloscope outputs signal forms freely selectable for the user. Sine wave forms, triangle forms or square signals are not a problem for this multifunctional device. Besides power supply via the included plug-in power supply, the oscilloscope can be operated via the integrated Li-Ion accumulator. This accumulator can operate for 6 hours. 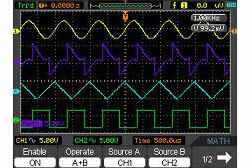 If the oscilloscope is used with accumulator the display will shut down after some time of inactivity to protect the accumulator. The 3 in 1 oscilloscope can be connected to a PC with one of the two integrated USB interfaces. The second interface allows the user to store the displayed pictures on USB stick. 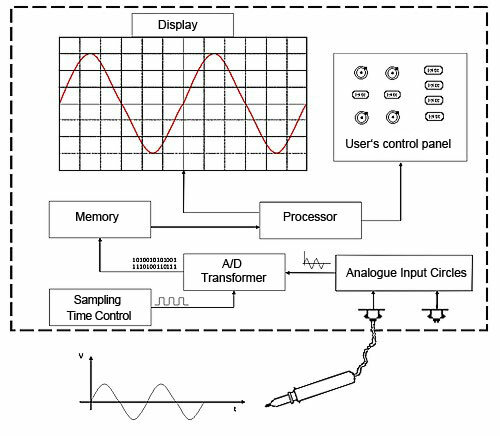 How does a digital memory oscilloscope work? The signal taken with the tactual probes will be adapted with the help of the analogue input circuit in the oscilloscope (divider, amplifier). Afterwards the signal will be placed on A/D transformer in the oscilloscope. The A/D transformer is the component that transforms an analogue input voltage into a digital numerical value. The attached signal will be scanned in a fixed frequency now. The values will be stored in the memory. 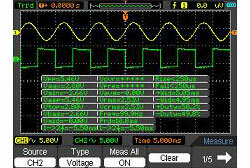 Moreover the values will be readout via a processor and displayed on the oscilloscope. The red points mark the scans of the oscilloscope. The oscilloscope mistakenly reconstructs a signal with a lower frequency according to the red points. To avoid this, the oscilloscope can be used in the low-pass filter on the input side. This filter filters out frequencies that are above the half scan frequency. 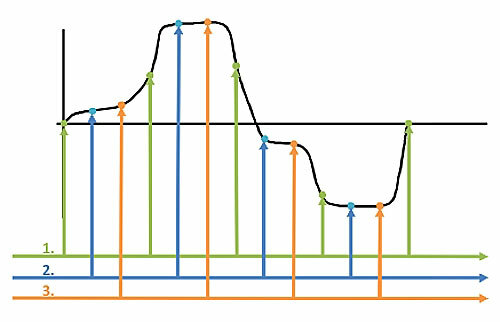 The time-shift measurement line is a helping tool with which the oscilloscope can reconstruct recurrent signals also with low sample rate. Thereby the oscilloscope will scan every period several times. However, the times of scanning will shift regarding the beginning of the period. The oscilloscope scans the signal several times time-shifted (blue and orange) after the first run (green). So the oscilloscope can reconstruct the signal exactly in spite of a low scan rate. The disadvantage of this progress is that the signal has to be recurrent. 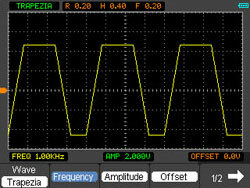 Very short and unique events can be taken by the oscilloscope. Trigger of the oscilloscope: if an oscilloscope displays an input signal just from left to right again and again, no fixed image could be created. Since the screen refresh frequency of an oscilloscope is usually very high and the signal would start from a random point we would only receive a jumping image. A trigger will be applied with every oscilloscope to solve this problem. This trigger enables a fixed image while it detects if the input signal (manual adjustable by an oscilloscope) exceeds or falls below a certain threshold amount. As soon as this so-called trigger event occurs the input signal will be shown on the display. Thus it can be achieved that the signal of the oscilloscope will be shown always from the same point. 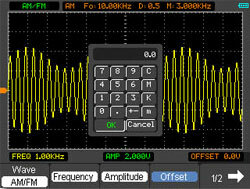 Furthermore, an oscilloscope always has the opportunity to perform the beginning via an external signal. A modern digital oscilloscope offers further possibilities to trigger. Calibrating of the oscilloscope: During a calibration the accuracy of the device, in this case the oscilloscope will be checked. Throughout this however, no intervention in the measuring system will be undertaken merely determining the deviation of indicated measured values through the creating of known and very accurate values. 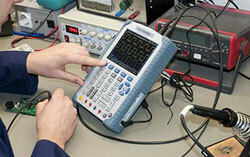 You can receive an ISO calibration certificate to this oscilloscope. The certificate is issued on your name and it certifies the accuracy of the particular device. The calibration happens in accordance with ISO 9000. That means that all values can be traced back to DKD-normal (DKD=German calibration service). Calibration certificate of the oscilloscope: deviations noticed during calibration (nominal value and current value) of the oscilloscope will be recorded in a document (calibration certificate). Calibration interval of the handheld oscilloscope: to guarantee the highest possible accuracy it is important to calibrate the oscilloscope again in a recurrent cycle. This period of time between two calibrations corresponds to the calibration interval. Calibration certificates usually have a validation of one year. Therefore a calibration interval of no more than one year will be assumed. Besides the portable oscilloscope you can also find oscilloscope as portable laboratory oscilloscope.